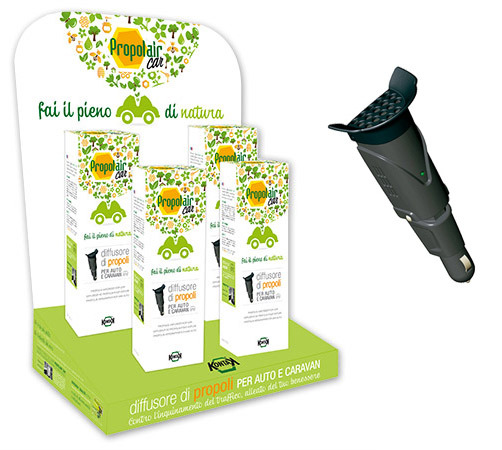 The new and original PropolAir Car is the only propolis diffuser on the market designed for cars, trucks and caravans. Designed for those who spend a lot of time traveling, Propolair Car gently heats up propolis contained in the capsule, slowly releasing the volatile fraction of propolis around your car. The propolis quickly fills the small space of your car, combating the harmful effects of urban traffic, making it ideal for city life and anyone traveling where there are high levels of pollution. PropolAir Car is simple to use, and thanks to its adjustable base can be folded and plugged into any cigarette lighter socket (12V) in the car or caravan.